In this lab, you will implement spawn, a library call that loads and runs on-disk executables. You will then flesh out your kernel and library operating system enough to run a shell on the console. These features need a file system, and this lab introduces a simple read/write file system. Branch lab5 set up to track remote branch refs/remotes/origin/lab5. Switched to a new branch "lab5"
fs/fs.c Code that mainipulates the file system's on-disk structure. fs/bc.c A simple block cache built on top of our user-level page fault handling facility. fs/ide.c Minimal PIO-based (non-interrupt-driven) IDE driver code. fs/serv.c The file system server that interacts with client environments using file system IPCs. lib/fd.c Code that implements the general UNIX-like file descriptor interface. lib/file.c The driver for on-disk file type, implemented as a file system IPC client. lib/console.c The driver for console input/output file type. lib/spawn.c Code skeleton of the spawn library call. You should run the pingpong, primes, and forktree test cases from lab 4 again after merging in the new lab 5 code. You will need to comment out the ENV_CREATE(fs_fs) line in kern/init.c because fs/fs.c tries to do some I/O, which JOS does not allow yet. Similarly, temporarily comment out the call to close_all() in lib/exit.c; this function calls subroutines that you will implement later in the lab, and therefore will panic if called. If your lab 4 code doesn't contain any bugs, the test cases should run fine. Don't proceed until they work. Don't forget to un-comment these lines when you start Exercise 1. If they don't work, use git diff lab4 to review all the changes, making sure there isn't any code you wrote for lab4 (or before) missing from lab 5. Make sure that lab 4 still works. As before, you will need to do all of the regular exercises described in the lab and at least one challenge problem. Additionally, you will need to write up brief answers to the questions posed in the lab and a short (e.g., one or two paragraph) description of what you did to solve your chosen challenge problem. If you implement more than one challenge problem, you only need to describe one of them in the write-up, though of course you are welcome to do more. Place the write-up in a file called answers-lab5.txt in the top level of your lab5 directory before handing in your work. The file system you will work with is much simpler than most "real" file systems including that of xv6 UNIX, but it is powerful enough to provide the basic features: creating, reading, writing, and deleting files organized in a hierarchical directory structure. We are (for the moment anyway) developing only a single-user operating system, which provides protection sufficient to catch bugs but not to protect multiple mutually suspicious users from each other. Our file system therefore does not support the UNIX notions of file ownership or permissions. Our file system also currently does not support hard links, symbolic links, time stamps, or special device files like most UNIX file systems do. Most UNIX file systems divide available disk space into two main types of regions: inode regions and data regions. UNIX file systems assign one inode to each file in the file system; a file's inode holds critical meta-data about the file such as its stat attributes and pointers to its data blocks. The data regions are divided into much larger (typically 8KB or more) data blocks, within which the file system stores file data and directory meta-data. Directory entries contain file names and pointers to inodes; a file is said to be hard-linked if multiple directory entries in the file system refer to that file's inode. Since our file system will not support hard links, we do not need this level of indirection and therefore can make a convenient simplification: our file system will not use inodes at all and instead will simply store all of a file's (or sub-directory's) meta-data within the (one and only) directory entry describing that file. Both files and directories logically consist of a series of data blocks, which may be scattered throughout the disk much like the pages of an environment's virtual address space can be scattered throughout physical memory. The file system environment hides the details of block layout, presenting interfaces for reading and writing sequences of bytes at arbitrary offsets within files. The file system environment handles all modifications to directories internally as a part of performing actions such as file creation and deletion. Our file system does allow user environments to read directory meta-data directly (e.g., with read), which means that user environments can perform directory scanning operations themselves (e.g., to implement the ls program) rather than having to rely on additional special calls to the file system. The disadvantage of this approach to directory scanning, and the reason most modern UNIX variants discourage it, is that it makes application programs dependent on the format of directory meta-data, making it difficult to change the file system's internal layout without changing or at least recompiling application programs as well. Most disks cannot perform reads and writes at byte granularity and instead perform reads and writes in units of sectors. In JOS, sectors are 512 bytes each. File systems actually allocate and use disk storage in units of blocks. Be wary of the distinction between the two terms: sector size is a property of the disk hardware, whereas block size is an aspect of the operating system using the disk. A file system's block size must be a multiple of the sector size of the underlying disk. The UNIX xv6 file system uses a block size of 512 bytes, the same as the sector size of the underlying disk. Most modern file systems use a larger block size, however, because storage space has gotten much cheaper and it is more efficient to manage storage at larger granularities. Our file system will use a block size of 4096 bytes, conveniently matching the processor's page size. File systems typically reserve certain disk blocks at "easy-to-find" locations on the disk (such as the very start or the very end) to hold meta-data describing properties of the file system as a whole, such as the block size, disk size, any meta-data required to find the root directory, the time the file system was last mounted, the time the file system was last checked for errors, and so on. These special blocks are called superblocks. 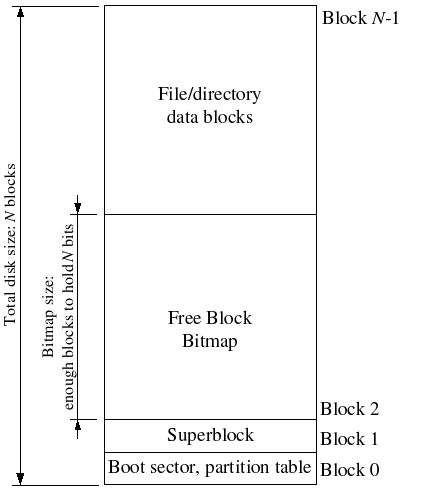 Our file system will have exactly one superblock, which will always be at block 1 on the disk. Its layout is defined by struct Super in inc/fs.h. Block 0 is typically reserved to hold boot loaders and partition tables, so file systems generally do not use the very first disk block. Many "real" file systems maintain multiple superblocks, replicated throughout several widely-spaced regions of the disk, so that if one of them is corrupted or the disk develops a media error in that region, the other superblocks can still be found and used to access the file system. The layout of the meta-data describing a file in our file system is described by struct File in inc/fs.h. This meta-data includes the file's name, size, type (regular file or directory), and pointers to the blocks comprising the file. As mentioned above, we do not have inodes, so this meta-data is stored in a directory entry on disk. Unlike in most "real" file systems, for simplicity we will use this one File structure to represent file meta-data as it appears both on disk and in memory. The f_direct array in struct File contains space to store the block numbers of the first 10 (NDIRECT) blocks of the file, which we call the file's direct blocks. For small files up to 10*4096 = 40KB in size, this means that the block numbers of all of the file's blocks will fit directly within the File structure itself. For larger files, however, we need a place to hold the rest of the file's block numbers. 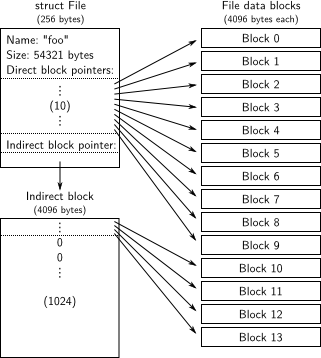 For any file greater than 40KB in size, therefore, we allocate an additional disk block, called the file's indirect block, to hold up to 4096/4 = 1024 additional block numbers. Our file system therefore allows files to be up to 1034 blocks, or just over four megabytes, in size. To support larger files, "real" file systems typically support double- and triple-indirect blocks as well. A File structure in our file system can represent either a regular file or a directory; these two types of "files" are distinguished by the type field in the File structure. The file system manages regular files and directory-files in exactly the same way, except that it does not interpret the contents of the data blocks associated with regular files at all, whereas the file system interprets the contents of a directory-file as a series of File structures describing the files and subdirectories within the directory. The superblock in our file system contains a File structure (the root field in struct Super) that holds the meta-data for the file system's root directory. The contents of this directory-file is a sequence of File structures describing the files and directories located within the root directory of the file system. Any subdirectories in the root directory may in turn contain more File structures representing sub-subdirectories, and so on. The goal for this lab is not to have you implement the entire file system, but for you to implement only certain key components. In particular, you will be responsible for reading blocks into the block cache and flushing them back to disk; allocating disk blocks; mapping file offsets to disk blocks; and implementing read, write, and open in the IPC interface. Because you will not be implementing all of the file system yourself, it is very important that you familiarize yourself with the provided code and the various file system interfaces. The file system environment in our operating system needs to be able to access the disk, but we have not yet implemented any disk access functionality in our kernel. Instead of taking the conventional "monolithic" operating system strategy of adding an IDE disk driver to the kernel along with the necessary system calls to allow the file system to access it, we instead implement the IDE disk driver as part of the user-level file system environment. We will still need to modify the kernel slightly, in order to set things up so that the file system environment has the privileges it needs to implement disk access itself. It is easy to implement disk access in user space this way as long as we rely on polling, "programmed I/O" (PIO)-based disk access and do not use disk interrupts. It is possible to implement interrupt-driven device drivers in user mode as well (the L3 and L4 kernels do this, for example), but it is more difficult since the kernel must field device interrupts and dispatch them to the correct user-mode environment. The x86 processor uses the IOPL bits in the EFLAGS register to determine whether protected-mode code is allowed to perform special device I/O instructions such as the IN and OUT instructions. Since all of the IDE disk registers we need to access are located in the x86's I/O space rather than being memory-mapped, giving "I/O privilege" to the file system environment is the only thing we need to do in order to allow the file system to access these registers. In effect, the IOPL bits in the EFLAGS register provides the kernel with a simple "all-or-nothing" method of controlling whether user-mode code can access I/O space. In our case, we want the file system environment to be able to access I/O space, but we do not want any other environments to be able to access I/O space at all. Exercise 1. i386_init identifies the file system environment by passing the type ENV_TYPE_FS to your environment creation function, env_create. Modify env_create in env.c, so that it gives the file system environment I/O privilege, but never gives that privilege to any other environment. Make sure you can start the file environment without causing a General Protection fault. You should pass the "fs i/o" test in make grade. Do you have to do anything else to ensure that this I/O privilege setting is saved and restored properly when you subsequently switch from one environment to another? Why? Challenge! Implement interrupt-driven IDE disk access, with or without DMA. You can decide whether to move the device driver into the kernel, keep it in user space along with the file system, or even (if you really want to get into the micro-kernel spirit) move it into a separate environment of its own. In our file system, we will implement a simple "buffer cache" (really just a block cache) with the help of the processor's virtual memory system. The code for the block cache is in fs/bc.c. Our file system will be limited to handling disks of size 3GB or less. We reserve a large, fixed 3GB region of the file system environment's address space, from 0x10000000 (DISKMAP) up to 0xD0000000 (DISKMAP+DISKMAX), as a "memory mapped" version of the disk. For example, disk block 0 is mapped at virtual address 0x10000000, disk block 1 is mapped at virtual address 0x10001000, and so on. The diskaddr function in fs/bc.c implements this translation from disk block numbers to virtual addresses (along with some sanity checking). Since our file system environment has its own virtual address space independent of the virtual address spaces of all other environments in the system, and the only thing the file system environment needs to do is to implement file access, it is reasonable to reserve most of the file system environment's address space in this way. It would be awkward for a real file system implementation on a 32-bit machine to do this since modern disks are larger than 3GB. Such a buffer cache management approach may still be reasonable on a machine with a 64-bit address space. Of course, it would take a long time to read the entire disk into memory, so instead we'll implement a form of demand paging, wherein we only allocate pages in the disk map region and read the corresponding block from the disk in response to a page fault in this region. This way, we can pretend that the entire disk is in memory. Exercise 2. Implement the bc_pgfault and flush_block functions in fs/bc.c. bc_pgfault is a page fault handler, just like the one your wrote in the previous lab for copy-on-write fork, except that its job is to load pages in from the disk in response to a page fault. When writing this, keep in mind that (1) addr may not be aligned to a block boundary and (2) ide_read operates in sectors, not blocks. The flush_block function should write a block out to disk if necessary. flush_block shouldn't do anything if the block isn't even in the block cache (that is, the page isn't mapped) or if it's not dirty. We will use the VM hardware to keep track of whether a disk block has been modified since it was last read from or written to disk. To see whether a block needs writing, we can just look to see if the PTE_D "dirty" bit is set in the uvpt entry. (The PTE_D bit is set by the processor in response to a write to that page; see 5.2.4.3 in chapter 5 of the 386 reference manual.) After writing the block to disk, flush_block should clear the PTE_D bit using sys_page_map. Use make grade to test your code. Your code should pass "check_bc", "check_super", and "check_bitmap". The fs_init function in fs/fs.c is a prime example of how to use the block cache. After initializing the block cache, it simply stores pointers into the disk map region in the super global variable. After this point, we can simply read from the super structure as if they were in memory and our page fault handler will read them from disk as necessary. Challenge! The block cache has no eviction policy. Once a block gets faulted in to it, it never gets removed and will remain in memory forevermore. Add eviction to the buffer cache. Using the PTE_A "accessed" bits in the page tables, which the hardware sets on any access to a page, you can track approximate usage of disk blocks without the need to modify every place in the code that accesses the disk map region. Be careful with dirty blocks. After fs_init sets the bitmap pointer, we can treat bitmap as a packed array of bits, one for each block on the disk. See, for example, block_is_free, which simply checks whether a given block is marked free in the bitmap. Exercise 3. Use free_block as a model to implement alloc_block in fs/fs.c, which should find a free disk block in the bitmap, mark it used, and return the number of that block. When you allocate a block, you should immediately flush the changed bitmap block to disk with flush_block, to help file system consistency. Use make grade to test your code. Your code should now pass "alloc_block". We have provided a variety of functions in fs/fs.c to implement the basic facilities you will need to interpret and manage File structures, scan and manage the entries of directory-files, and walk the file system from the root to resolve an absolute pathname. Read through all of the code in fs/fs.c and make sure you understand what each function does before proceeding. Exercise 4. Implement file_block_walk and file_get_block. file_block_walk maps from a block offset within a file to the pointer for that block in the struct File or the indirect block, very much like what pgdir_walk did for page tables. file_get_block goes one step further and maps to the actual disk block, allocating a new one if necessary. Use make grade to test your code. Your code should pass "file_open", "file_get_block", and "file_flush/file_truncated/file rewrite", and "testfile". file_block_walk and file_get_block are the workhorses of the file system. For example, file_read and file_write are little more than the bookkeeping atop file_get_block necessary to copy bytes between scattered blocks and a sequential buffer. Challenge! The file system is likely to be corrupted if it gets interrupted in the middle of an operation (for example, by a crash or a reboot). Implement soft updates or journalling to make the file system crash-resilient and demonstrate some situation where the old file system would get corrupted, but yours doesn't. Everything below the dotted line is simply the mechanics of getting a read request from the regular environment to the file system environment. Starting at the beginning, read (which we provide) works on any file descriptor and simply dispatches to the appropriate device read function, in this case devfile_read (we can have more device types, like pipes). devfile_read implements read specifically for on-disk files. This and the other devfile_* functions in lib/file.c implement the client side of the FS operations and all work in roughly the same way, bundling up arguments in a request structure, calling fsipc to send the IPC request, and unpacking and returning the results. The fsipc function simply handles the common details of sending a request to the server and receiving the reply. The file system server code can be found in fs/serv.c. It loops in the serve function, endlessly receiving a request over IPC, dispatching that request to the appropriate handler function, and sending the result back via IPC. In the read example, serve will dispatch to serve_read, which will take care of the IPC details specific to read requests such as unpacking the request structure and finally call file_read to actually perform the file read. Recall that JOS's IPC mechanism lets an environment send a single 32-bit number and, optionally, share a page. To send a request from the client to the server, we use the 32-bit number for the request type (the file system server RPCs are numbered, just like how syscalls were numbered) and store the arguments to the request in a union Fsipc on the page shared via the IPC. On the client side, we always share the page at fsipcbuf; on the server side, we map the incoming request page at fsreq (0x0ffff000). The server also sends the response back via IPC. We use the 32-bit number for the function's return code. For most RPCs, this is all they return. FSREQ_READ and FSREQ_STAT also return data, which they simply write to the page that the client sent its request on. There's no need to send this page in the response IPC, since the client shared it with the file system server in the first place. Also, in its response, FSREQ_OPEN shares with the client a new "Fd page". We'll return to the file descriptor page shortly. Exercise 5. Implement serve_read in fs/serv.c. serve_read's heavy lifting will be done by the already-implemented file_read in fs/fs.c (which, in turn, is just a bunch of calls to file_get_block). serve_read just has to provide the RPC interface for file reading. Look at the comments and code in serve_set_size to get a general idea of how the server functions should be structured. Use make grade to test your code. Your code should pass "serve_open/file_stat/file_close" and "file_read" for a score of 70/150. Exercise 6. Implement serve_write in fs/serv.c and devfile_write in lib/file.c. Use make grade to test your code. Your code should pass "file_write", "file_read after file_write", "open", and "large file" for a score of 90/150. We have given you the code for spawn (see lib/spawn.c) which creates a new environment, loads a program image from the file system into it, and then starts the child environment running this program. The parent process then continues running independently of the child. The spawn function effectively acts like a fork in UNIX followed by an immediate exec in the child process. We implemented spawn rather than a UNIX-style exec because spawn is easier to implement from user space in "exokernel fashion", without special help from the kernel. Think about what you would have to do in order to implement exec in user space, and be sure you understand why it is harder. Exercise 7. spawn relies on the new syscall sys_env_set_trapframe to initialize the state of the newly created environment. Implement sys_env_set_trapframe in kern/syscall.c (don't forget to dispatch the new system call in syscall()). Test your code by running the user/spawnhello program from kern/init.c, which will attempt to spawn /hello from the file system. Use make grade to test your code. Challenge! Implement mmap-style memory-mapped files and modify spawn to map pages directly from the ELF image when possible. The UNIX file descriptors are a general notion that also encompasses pipes, console I/O, etc. In JOS, each of these device types has a corresponding struct Dev, with pointers to the functions that implement read/write/etc. for that device type. lib/fd.c implements the general UNIX-like file descriptor interface on top of this. Each struct Fd indicates its device type, and most of the functions in lib/fd.c simply dispatch operations to functions in the appropriate struct Dev. lib/fd.c also maintains the file descriptor table region in each application environment's address space, starting at FDTABLE. This area reserves a page's worth (4KB) of address space for each of the up to MAXFD (currently 32) file descriptors the application can have open at once. At any given time, a particular file descriptor table page is mapped if and only if the corresponding file descriptor is in use. Each file descriptor also has an optional "data page" in the region starting at FILEDATA, which devices can use if they choose. We will change fork to know that certain regions of memory are used by the "library operating system" and should always be shared. Rather than hard-code a list of regions somewhere, we will set an otherwise-unused bit in the page table entries (just like we did with the PTE_COW bit in fork). We have defined a new PTE_SHARE bit in inc/lib.h. This bit is one of the three PTE bits that are marked "available for software use" in the Intel and AMD manuals. We will establish the convention that if a page table entry has this bit set, the PTE should be copied directly from parent to child in both fork and spawn. Note that this is different from marking it copy-on-write: as described in the first paragraph, we want to make sure to share updates to the page. Likewise, implement copy_shared_pages in lib/spawn.c. It should loop through all page table entries in the current process (just like fork did), copying any page mappings that have the PTE_SHARE bit set into the child process. Use make run-testpteshare to check that your code is behaving properly. You should see lines that say "fork handles PTE_SHARE right" and "spawn handles PTE_SHARE right". Use make run-testfdsharing to check that file descriptors are shared properly. You should see lines that say "read in child succeeded" and "read in parent succeeded". For the shell to work, we need a way to type at it. QEMU has been displaying output we write to the CGA display and the serial port, but so far we've only taken input while in the kernel monitor. In QEMU, input typed in the graphical window appear as input from the keyboard to JOS, while input typed to the console appear as characters on the serial port. kern/console.c already contains the keyboard and serial drivers that have been used by the kernel monitor since lab 1, but now you need to attach these to the rest of the system. Exercise 9. In your kern/trap.c, call kbd_intr to handle trap IRQ_OFFSET+IRQ_KBD and serial_intr to handle trap IRQ_OFFSET+IRQ_SERIAL. We implemented the console input/output file type for you, in lib/console.c. kbd_intr and serial_intr fill a buffer with the recently read input while the console file type drains the buffer (the console file type is used for stdin/stdout by default unless the user redirects them). Test your code by running make run-testkbd and type a few lines. The system should echo your lines back to you as you finish them. Try typing in both the console and the graphical window, if you have both available. Note that the user library routine cprintf prints straight to the console, without using the file descriptor code. This is great for debugging but not great for piping into other programs. To print output to a particular file descriptor (for example, 1, standard output), use fprintf(1, "...", ...). printf("...", ...) is a short-cut for printing to FD 1. See user/lsfd.c for examples. The shell doesn't support I/O redirection. It would be nice to run sh <script instead of having to type in all the commands in the script by hand, as you did above. Add I/O redirection for < to user/sh.c. Run make run-testshell to test your shell. testshell simply feeds the above commands (also found in fs/testshell.sh) into the shell and then checks that the output matches fs/testshell.key. directories, cd, and a PATH for command-lookup. but feel free to do something not on this list. Your code should pass all tests at this point. As usual, you can grade your submission with make grade and hand it in with make handin. This completes the lab. As usual, don't forget to run make grade and to write up your answers and a description of your challenge exercise solution. Before handing in, use git status and git diff to examine your changes and don't forget to git add answers-lab5.txt. When you're ready, commit your changes with git commit -am 'my solutions to lab 5', then make handin to submit your solution.